When calibrating or testing a gauge or transducer with a pneumatic pressure controller it is important to protect the controller from any liquid contaminants that may be present in the device under test (DUT). A block and bleed valve (BBV) in-line with a coalescing filter is a good way to do this. The potential flow of containments is from the DUT to the controller. A BBV and a coalescing filter, oriented as seen in the diagram above, will to work to prevent contamination. The BBV is used to purge the bulk of liquid from the DUT. 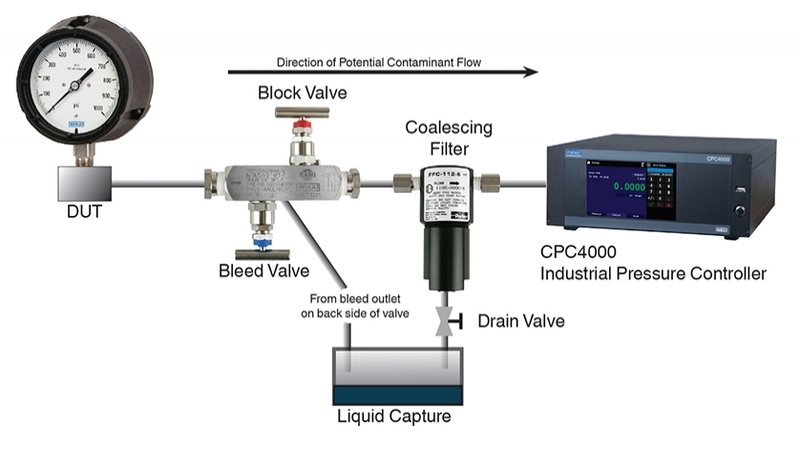 The coalescing filter is a backup to eliminate any residual liquid that may be present even after the initial purge and will separate entrained liquid droplets from gas flowing in the direction of the controller. The following procedure is designed to prevent damage to a pneumatic pressure controller from a contaminated DUT. Before connecting the DUT to the system, remove as much liquid as possible from the DUT. With the controller power off and both the block and bleed valve closed, connect the system as shown above. Use the controller to apply a pressure close to the full scale pressure of the DUT. Open the block valve slowly to pressurize the DUT (note: the gas will flow in the direction of the controller to the DUT – high pressure to low pressure). After the system is pressurized close the block valve. Open the bleed valve and purge the system to atmospheric pressure. Observe the sump to see if any liquid is purged. Repeat steps 3 to 7 until no more liquid is observed coming out of the system. With the block and the bleed valves securely closed, vent the controller. After completion of the above procedure it should now be safe to calibrate the DUT. To calibrate, open the block valve and close the bleed valve. The coalescing filter will coalesce (join together) any liquid droplets that may still be present in the gas, and gravity will draw the liquid to the bottom of the filter housing. The filter will also remove particles larger than the specified size. An automatic or manual valve can be attached to the bottom of the filter housing to periodically drain any liquid that has accumulated. 1. The coalescing filter will not protect against a large slug of liquid that fills the housing and is forced through the filter membrane or liquid vapor. 2. The gas used to calibrate the DUT can flow in either direction within this system. 3. There will be a pressure drop across the filter in the flowing condition; at steady state pressure there is no pressure drop. I earned a bachelor of science degree in industrial engineering, from Texas A&M University in 1981. I worked in the Texas oilfield, and with industrial instrumentation distributors before joining Mensor Corporation in 1998. At Mensor (acquired by WIKA in 2006) I have worked as a regional sales manager and marketing manager with the primary responsibility of providing information to our customers and prospects about the superior quality, features and benefits of the products produced by Mensor and the calibration technology division of WIKA. Calibration or adjustment – where’s the difference?